Isn’t this cool! I just love the way it is looking. Did I tell you that if you knit you really need to try making this Swing Cowl by Angela Meinz? LOL Yes I believe I did – but seriously, it is just fun to knit and so easy. And if you look at the pattern page on Ravelry, you’ll see a photo of mine in progress there. The designer saw it and asked if she could add it to her page – how cool is that! I’m already thinking about what other yarn combinations I might use for the next one. Updated: I forgot to add this earlier to this blog post. I came across this link that shows how to do the “double stitch” short rows referred to in the pattern which you may find to be a useful reference. A couple weeks ago when I was first contemplating what yarn I wanted to use for my version of Dreambird, I was looking through the Ravelry Project pages to see what types of yarn others had used. This was the yarn I had ordered – it is what I called a bit mucky since it was not the brighter colors that had shown up on the shop’s website so that was disappointing, but these colors are growing on me (and my photo is a bit off too so you’re not seeing a real true image). If you are planning to knit along on Dreambird there are some easy ways to try to figure out what yarn you may want to use so here’s some helpful hints. Have you created your free Ravelry account? No knitter (or crocheter) should be without one in my opinion. LOL If you are new to Ravelry, you should take a little time to figure out all the wonderful things they offer. And unlike many free pattern sources that then inundate you with emails – the only emails I ever get from Ravelry are when a file I have purchased has been changed — an update is sent out to everyone who has previously purchased it and you get an email notification. The only other emails have been when I’m doing a KAL and of course the clues are announced through email but never any junk email — that I love! Judy and I have gotten questions asking about what kind of yarn to use. We can’t answer that specific question for you – you may not like what we like, you may not want to spend over a certain dollar amount, or a specific yarn may not be available everywhere and most of all, everyone has different tastes in color, texture, perhaps you can’t wear a specific type of yarn or don’t want to hand wash it — there are many personal decisions that go into picking the yarn so you hopefully end up with a final project you love. There are many kinds of yarn that have longer color changes that will give the look you see in many of the finished Dreambirds. Some finished Dreambirds makers also used scraps of different colors to make their feathers; others used just two colors. Log into Ravelry, and if you go to the Dreambird pattern (just click on Patterns and in the search bar type in Dreambird. When it brings it up just click to open the info on it. At the top of that screen above the name Dreambird, you will see tabs that say Details – Yarn Ideas – 871 Projects. The 871 may change depending on if someone finishes their projects and adds more. But click on Yarn Ideas and you will see – you guessed it! – all kinds of yarn ideas for this project. If you click on 871 Projects tab — you will see all the projects people are working on or have finished. You can “read more” on each one of those little boxes and some people will list the type of yarn they used. This will also help you decide what kind of yarn you want to use. Now back to the photo at the top — one of the yarns I kept coming across in the project pages that I liked the look of with the long color repeats was Unisono. 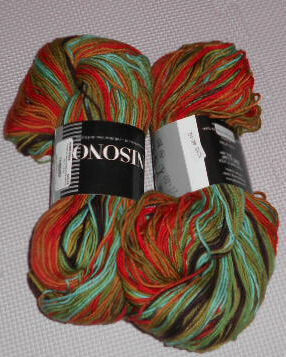 Unisono is one of the yarns listed on the Yarn Ideas tab. It tells below the picture of it how many times that yarn has been used for a Dreambird. If you click on the number of times below the image, it will show you the projects that used that yarn. I had never heard of it and wondered if it was available in the United States. If you “read more” on one of those projects that used the yarn, many times there will be a link to shows that carry it that you can order it from. Thaloniusmom’s Dreambird in Autumn just happens to use the same color number as my yarn above tho hers looks like it may be bit brighter than mine but that is the nature of hand dyed yarn — a variance from hank to hank. But I love the look of that shawl. So now I have my feather yarn chosen! I haven’t decided yet what the background color will be. I may have some black in the stash that will work if I have enough of it, but if not, I may use a cream or very light tan instead. I’ll have to go digging through the stash this weekend to see what I find. Will you be joining Judy and I as we work on our Dreambird shawls? Judy and I have both admired that pattern for a long time and we’re finally going to jump in and give it a whirl. It’s always more fun when several people are working on the same project – showing photos of their progress, yarns they are using. Judy will be providing linky boxes so we can share our yarn (share photos of our yarn — no we are not sending you our yarn) and our progress and cheer each other on to the finish. We plan to start the end of August after Camp Loopy is done and there’s no finish date – it’s not a race, it’s just a project we plan to start then. You can find more info in Judy’s blog post here explaining what we are up to rather than me repeating it all here. I ripped it out and restarted with a smaller “wedge” and things are moving along well now. I’m just a row or two into the third wedge. This is super simple to make but I’m always in awe of the people who come up with these ideas. flippin through the latest Quiltmaker that arrived and….. hey, I recognize that quilt. And for those who have asked in the past what the blue and yellow fabrics were that I colored in the original Heads or Tails bird design with – that line is Riverwoods Collection, Midnight Blue by Karen Combs (Troy Corporation). Those who asked I told that I didn’t know if they were still available since they came out in one of last year’s EQ stash updates. However, there’s a big ad in Quiltmaker for that line as well so they must still be readily available. For those who were thinking of making the Kinta project from Ravelry that I did for my Camp Loopy 1 project — after a couple people who made it added to their Ravelry project pages that yarn had run short in the yardage indicated and we couldn’t do as many repeats as the pattern called for, the designer has upped the yardage amount and decreased the repeats so hopefully no one else will have that issue. Just like quilting patterns, knitting ones sometimes need some tweaking even through they’ve been edited and tested. That’s the beauty of the project pages in Ravelry- designers can see who makes their designs and if they had any issues that may need to be looked at a second time. If they need to make a correction to the pattern and you have it in your “library”, you automatically get an email and it shows that you need to download the update in your library. Many times I buy patterns but don’t start them right away, or for months, or perhaps a year…… but when I do go back to print the pattern the update will be waiting for me. And if you’re thinking about making a particular pattern – you can see all the projects others have made in all different kinds of yarn to help decide what you might like. Tho mine didn’t have as many repeats – it’s still pretty and a good, wearable size. And no, I have no connection to the designer or Ravelry – just a happy knitter and Ravelry user — but if you’re a knitter (or crocheter) and haven’t checked out Ravelry you don’t know what you’re missing. Speaking of which – the Welted Beanie pattern is from there, and is free, and it is turning out so cute (tho I don’t know if my Dad would like to hear that I’m making him a ‘cute’ hat) LOL and no, those flowers are not part of it – they are stitch markers. LOL I love the brim of it — four welts (you can see how they look more easily on the pattern in Ravelry that is done in a solid color) but they look like four rows of corded piping to put it in more sewing/quilting terms. I’m on the final decreases at the top and need to switch from my circular needle to dps. It is a fast and super easy knit. I think I’ll be making more of these – they would be great hats for charity. I always hated hats with lots of ribbing and none of that to do on this one. My design wall looks the same as the weekend — I need to figure out how I want to set these together and probably make a few more. The other, larger design wall still has CTS blocks on it – and has for months. I really need to get those finished – or take them down for a while. 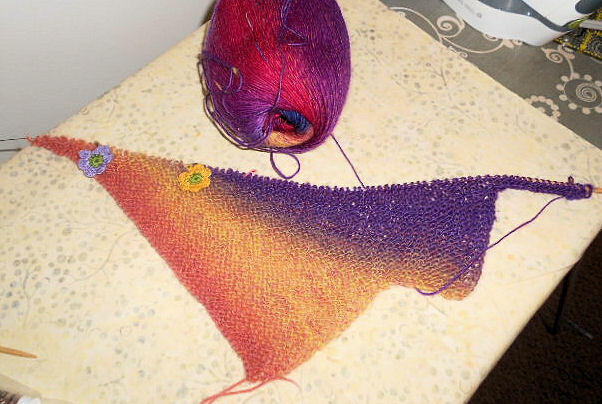 What I have made some progress on is the Silent Goal Mystery KAL shawl. I’ve got clue 2 almost finished – just two or three more rows and then I can move on to the last clue released last Saturday. 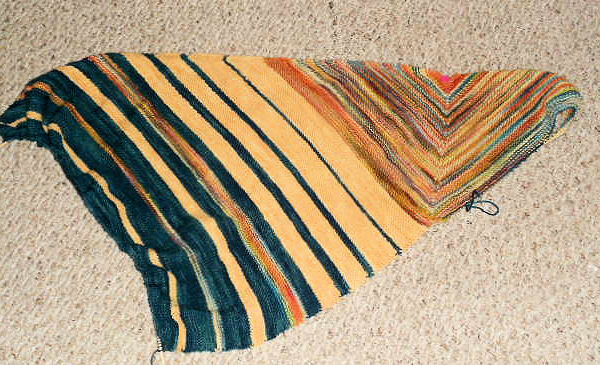 I, of course, have looked at the shawl pictures of all those speedy knitters who already have that clue nearly finished. I sort of had an idea where we were headed and I have decided to switch my fourth color. It was a much lighter shade of blue and I really like the dark tealy blue I used so my second blue is just a tiny bit lighter than the dark one I’m using. I may have to wait to start the next clue tho since I don’t know that I have a circular needle in the correct size that is longer than the one I’m using and I think I’ll need it. I may be able to get by for the first part of the next clue but not the finishing so we’ll see how far I’m able to go with the length of circular I’m currently using. I do like the two strips I added in in place of the gold using my multicolor. I’m going to add a couple multicolored stripes into the other side too. This is what’s on the needles at the moment — and as soon as I get off the computer it will be ripped back off the needles. Now as for the yarn — I’ve said about other yarns I’ve knit with that they were so lovely and soft but none – no not one of those other brands can match this one. It’s light as air as you knit with it and the softness is phenomenal. It’s Sireno which is 50% silk / 50% merino and 675 yards on a hank. This color is called Tiffany. I can’t remember where I bought it. I know I bought it online but I think I just came across a really great sale on it somewhere I had never shopped before. I have a second hank, with even more yardage on it, in burgundy and other fall colors. But it is just the most wonderful feeling yarn and will feel and drape so nicely made up as the 3S Shawl. Looking for a new project to start — heck knit along with me on the 3S Shawl — it doesn’t take much yarn, the pattern is free, go dig in that stash and cast on. LOL I do have to go see if I have the right size needles but if not, I’ll just choose the size close to the size listed — it’s really not going to matter that much. 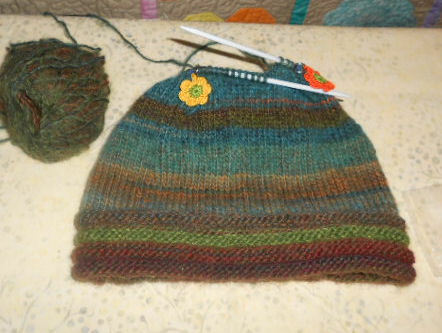 This is also coming off the needles this weekend – but not because I’m ripping it out. I just need to weave the toe and the first SKYP sock from the No-seeum Camp Loopy colorway will be done. Remember the Loopy Ewe first quarter challenge project – the scarf I made but it was too small so I ripped it out. Well it’s now a hat – of course a cabled hat – so I can decide which photo I want to submit for the challenge. Here are some really lousy photos of it. LOL I’ll have to take a picture in real daylight, perhaps even on a real head! Its the Mondo Cable Cap by Bonne Marie Burns which you can find on Ravelry. Here’s a photo of the top where all the cables come together which is really pretty. Check out the photos on Ravelry tho cause mine don’t do it justice. 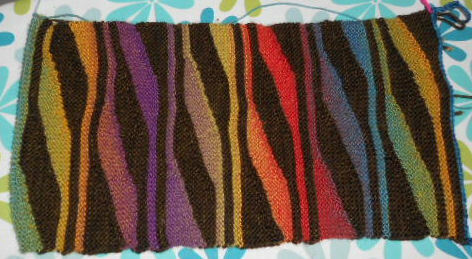 It was a really quick knit – I think I started it Monday afternoon and finished it Tuesday night. And with only 3 cable twists, it’s not real fiddly to do the cables. Another finish to add to my Stitcks ‘n Strings list — I need to update that page on the weekend before I forget which things got finished. I’m still plodding along on a pair of socks – about 2″ to go on the foot of the first one – and knitting on the Greta vest. Many things are on many needles – I still haven’t gathered them all together to figure out my plan of attack for getting the Unfinished Knitty Objects (UKOs) finished. But the three that I am currently working on are the Drifted Pearls scarf – Camp Loopy 1st Quarter project which you can see HERE in yesterday’s blog post. Although it doesn’t look like much all scrunched up on the circular needle, here’s how far I am on the Greta vest. Both those patterns can be found on Ravelry. There’s also a pair of SKYP socks I’ve been working on – just another 2″ or so on the foot of the first sock and I’ll be ready to finish that one off. See what others have on their needles over at Judy’s. No I did not immediately (or as of yet) place an order. LOL I’m not saying I’m out of the woods yet tho since my current fabric combination love is yellow and gray and there are some oh so pretty shades that I keep thinking wouldn’t one of my bid blocks look so pretty and springy in those (we’re headed toward single digits next week so I’m trying to think ahead to spring!). It was a bit disappointing tho that inside the catalog, where they show the fabric line that I designed the quilt pattern for, someone goofed and they gave credit for the “quilt design” (mine) to the “fabric line designer.” But I’ll get over it – mistakes happen. 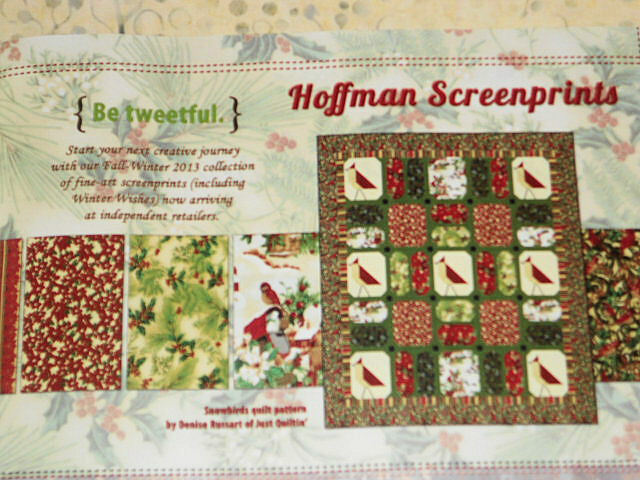 Don’t forget that tomorrow is the first Stitchin with Justquiltin 2013 free project. Button in the sidebar is the place to find all info on this project. I haven’t decided yet if I’ll go pull more fabrics for this one in this size or if I’ll just concentrate on getting the smaller version I made last weekend quilted. 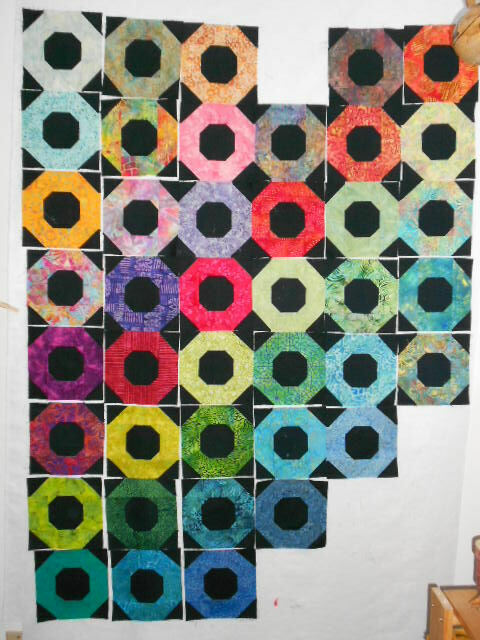 I’ve got so many tops waiting to be quilted and I generally don’t repeat making a quilt design even in a different size. But remember — in order to qualify for drawings for some of the “Justquiltin swag”, you need to actually stitch along , since at some point in the future I’ll ask you to post comments on a particular blog post with a link to share your progress on a project so we can see some eye candy and what fabrics you are using. Tote bag, mouse pads, pens — just little goodies to give away. Okay -time to get seriously busy around here. Okay now it’s getting really trickey to load photos. I can’t see them after I added them to the page but if I view a draft of the page they are there. So in the end, there may be a photo on this page….. or not….. when you see it. I don’t know what the heck WordPress did but I am now officially annoyed. It’s the One Row Handspun Scarf Pattern from Yarnharlot which can be found on Ravelry. I used two sock yarns held together. One was Painted Tiger (love her hand dyed yarns) Bengal Twist in Blue Spruce and the other was a Poems Sock yarn that changed colors. It will go into the gift/donate stash since I didn’t make it for anyone in particular until I decide what I want to do with it. Since I finished a project – I can start a new project! But since I don’t know what I want to start, I’ll keep knitting along on some socks in progress. I’m also going to keep track again of the total yards knit — adding them in only when a project is completed — simply because it’s fun to see how many miles of yarn you have knit. I knit (completed) over 5 miles of yarn last year — hmmm wonder how much it would have been if I didn’t have all those half finished projects that weren’t counted!